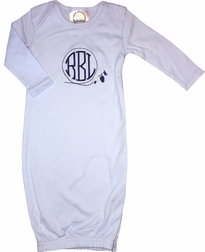 Our personalized, monogrammed baby gowns for newborn, infant boys are made with premium 7.5 oz 100% cotton interlock knit fabric in light blue. They are made specifically for embroidery and monograms. 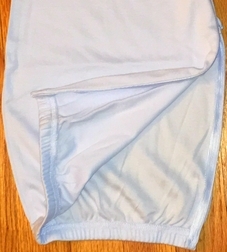 They have long sleeves that keep baby cozy and warm all year and a hidden side zipper for ease of diaper changing. These gowns are wonderfully traditional, and perfect for baby shower gifts and bringing that sweet baby home from the hospital (and don't forget to use the gown for pictures at the hosptial!) 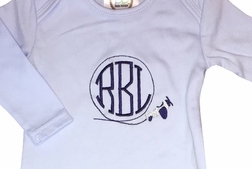 We monogram the baby's initials inside a flying airplane on the front.